Tennis anyone? 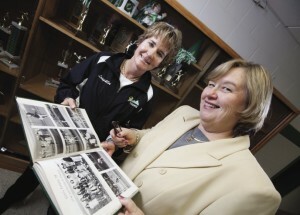 Katie Mahoney Loughlin and her former tennis coach Kathleen Dwyer flip through old team photos. There is a special spirit that fills the halls and classrooms at Seton Catholic Central High School in Binghamton, and that spirit extends to every department, every athletic team, right down to the principal, Kathleen Dwyer, and her availability to anyone who knocks on her office door. 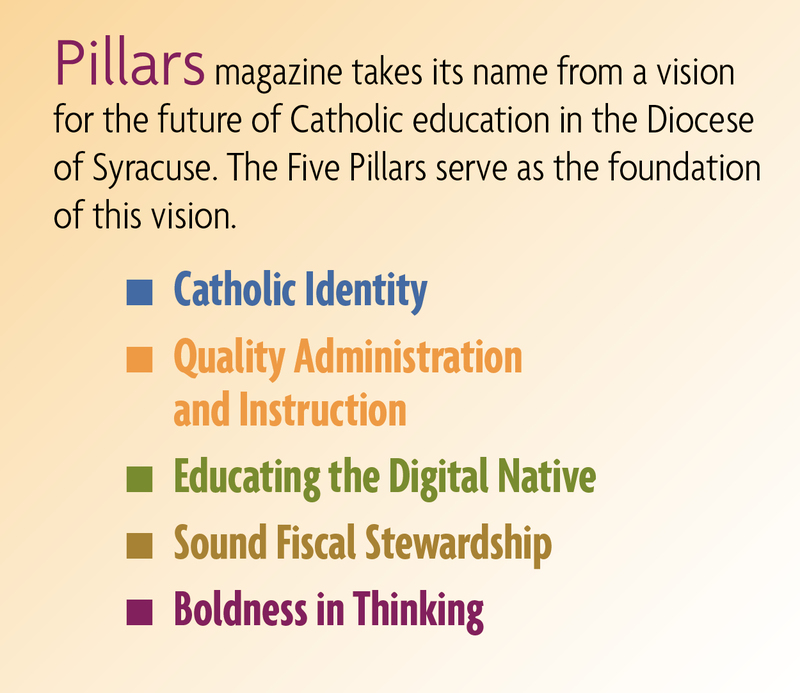 At Seton, her casa is your casa and there are obvious strong bonds between parents, students, staff, educators and administrators. Katie Mahoney Loughlin, ’82, was a member of that team, and now she’s coaching tennis at Seton. She has truly come back to her roots, and her tennis team is pretty remarkable, too. Loughlin’s players, including her daughter Ellen, said they enjoy their time on the tennis team more than the other sports they’ve played. Players Julia O’Connor and Haley Farrell, both seniors, have taken tennis lessons since they were little. They enjoy playing on Loughlin’s team and what she brings to her experience as their coach. The girls practice tennis two hours a day during the season, mid-August to late October, depending upon how far they make it in the tournaments. A sense of belonging is a benefit to any high school student, and, for players O’Connor and Farrell, the tennis competition is fun, but it is Loughlin’s approach to the game that appeals to them. Both Dwyer and Loughlin talk about the life-long aspect of being a tennis player. It is a sport that is easy to stick with even after high school. She gave up her tennis coaching when she became principal in the 1980s. And, even though Loughlin gave up tennis to play soccer, Dwyer doesn’t hold it against her. When she’s not on the tennis court, Loughlin is a stay-at-home mom with four children — two at Seton and two at St. James in Johnson City. Loughlin and her husband, Kevin, knew they wanted their children to attend Catholic school when they moved back to the area to raise their family. Loughlin said she finds the sense of community at Seton a great benefit as a coach and as a parent. Now in her fifth year of coaching, she is happy to follow in Dwyer’s footsteps.